Okay, so please don't throw anything at me. I'm what you might call a "late to the party" kind of guy. As in, um, about three or four years late to the party. I finally (finally) picked up the first hardcover collection of Robert Kirkman's Image sensation, The Walking Dead, which collects issues 1 through 12 of the acclaimed series. You know, the one that spawned the recent (and lingering!) zombie craze in comics, the series that is atop every single critic's pull list month in and month out. Yeah, like I said, I missed that boat. But I have righted my past indiscretions, and I have finally submitted to the call of this creepy, black and white (new) classic. Anyway, I was pretty much neutral about the book when I first read it, so I really didn't pay much attention to its meteoric rise through comicdom, other than to look at it as a shining example of a little indie book that could seemingly take over the comics world. I think the thing that kinda bugged me when I read it the first time around (and again, it was only a few issues, so I really shouldn't have judged it either way) was the fact that there were no captions. No thought captions, I should say. At that point in my comics reading...um...career?...I was still fairly new to the medium, and I associated books without captions with books written in the 1970s or earlier, before Frank Miller and Alan Moore changed the landscape. And that's not to say books from that era aren't great. Because they are. Great, I mean. Lemme dig myself right on outta this here hole, and say that what got me was the fact that I didn't see enough introspection from the characters. Usually, those little boxes tell me exactly what each character is feeling. With them missing, the emotional impact and weight of the story relied solely on dialogue. Everything is dialogue, and dialogue is everything in this series. And, because of that, there's recaps in the dialogue,and sometimes there's exposition that tends to be a little heavy handed. (Like in this post!) But Kirkman does this very sparingly, and usually the dialogue beats are fast and furious, and they do a good job in mimicking real, human speech patterns. And now that I've re-read the first 6 issues and moved on to the next 6 issues, I realize that there needs to be certain exposition in the dialogue because there are no captions. Kirkman manages to get the emotions across in a "show me, don't tell me" way that is kinda lost in comics, because of all the captions that are used. And that fact alone makes this book stand out and makes what Kirkman achieved with the title that much greater. At this point, I should probably give a little bit of a summary of the book, since this post has been rambling for a while now. The tag line is a simple, and brilliant, one, addressed by the author in the afterword of this collection. It's a zombie story that doesn't end with the credits. It keeps going. We get to see what happens after the main characters make it through the night. We get to see the ramifications of losing a loved one in an attack. We get to see the toll that isolation takes on a man's soul. We get to see how a small group of people can change and go through ups and downs, and come to despise old friends. We see that sometimes the zombies aren't the scariest thing around. And then we get to see that, yes, yes they absolutely are. And that makes for a great story. So, if you're a zombie fan, then I'm assuming you are already an avid follower of this book. I'm not the biggest zombie fan in the world, but this book really struck a chord with me, and I will be seeking out the rest of the hardcovers. Before I wrap this up, I should mention the art. Tony Moore and Charlie Adlard, the pencilers for the first two arcs, really nailed it. I mean, these are zombies done right. As I mentioned, the book is in black and white, and personally, I think all zombie anything should be in black and white. There's just something right about that, know what I mean? 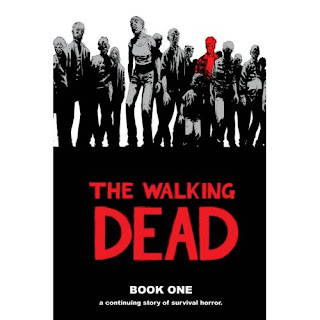 Robert Kirkman is known for surprises and big deaths in his books, and The Walking Dead will keep you guessing and on the edge of your seat with each page. I really can't wait to get my hands on the next part of the story.